When Mom was too busy to play piano, my sister Robin and I would sit together on the couch, turning the pages of the book, choosing which of the illustrated children we wanted to be. We would take turns- hoping to be the first to pick the angel proclaiming “Hark! The Herald Angels Sing,” or the child stepping in the footsteps of “Good King Wenceslas” as he trudged through the snowy wood. Robin resembled the cherubs in the illustrations, with her huge round eyes and fair skin, and because she was much smarter than I, had figured out how to time her turn to choose the favorite picture, time after time. I never really minded, though. Somehow, sharing a game with a cuddly little sister on a cold snowy winter provides more comfort than competition. But soon we would tire of the game and beg our mother to play to us from the gilded book. When I think back to those days, I wonder how we actually sounded. The piano was a cast off, a huge out-of-tune monstrosity. Several of the keys were missing the ivory overlays- their wooden surfaces grinning like so many missing teeth, and a few of the notes failed to play, no matter how hard they were struck. And although the children in Bing Crosby Christmas movies always sang sweetly in tune, I suspect that my mother’s rambunctious brood fell a fair bit short of Hollywood’s cherubic crooners. 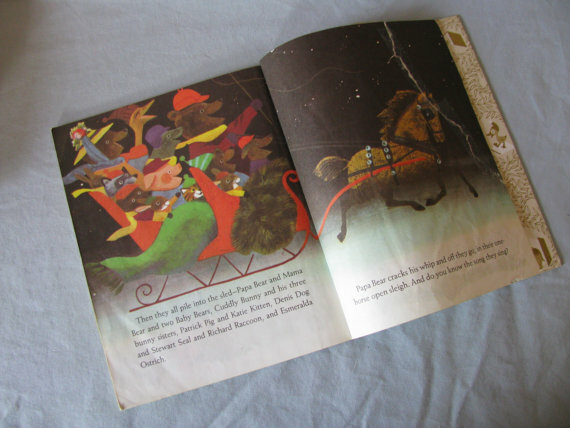 Years later, when my children were toddlers, I bought them Kathleen Daly’s “Jingle Bells,” a Little Golden Book about a sleigh full of animals who sing as they travel for a Christmas celebration. As an ostrich climbs into the sleigh, she very loudly sings a verse from the song. As I read to my children, the following line burned in my heart, and is imprinted there still. Immediately I thought back to the scenes in our old dining room. To be sure, we were no competition for the von Trapp family, but this is the way I learned the classic carols, and how I learned to sing harmonies. I always envisioned the melody line to be like my mother- strong, steady and predictable, and the harmonies to be like her many silver children, tripping around her in unexpected dance steps-straying just so far- only to rejoin her at the end of the stanza. Those chaotic choral exercises were the training ground for me to help put myself through college singing in local pubs and coffee houses. 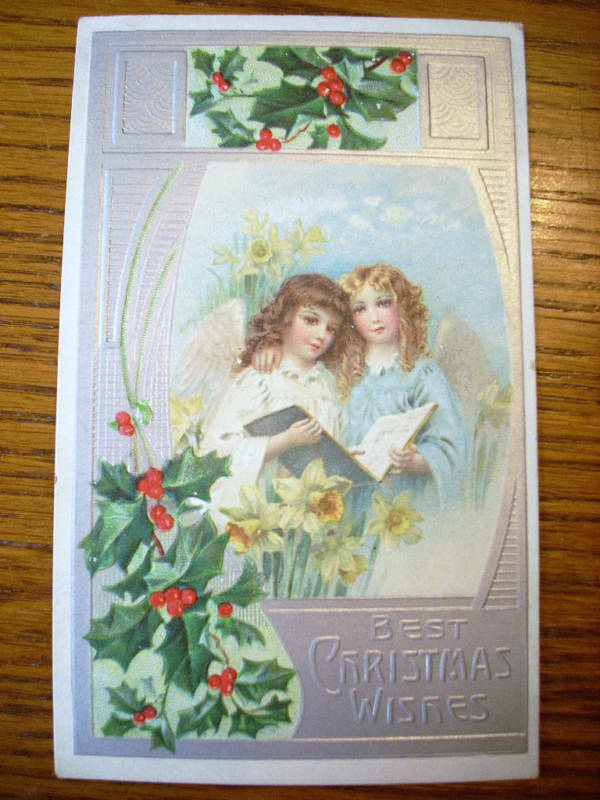 But more than that, the memories of singing the carols from that old book are a glowing Christmas gift I enjoy year after year. The memories begin in my heart, bringing warmth and smiles, and tears of joy that spill out like silver and gold harmonies that bring warmth and smiles and tears of joy to others. And now I understand. How we sounded mattered not at all. We didn’t sing very well, but nobody minded, because it was Christmas. In New England, November is gray. The lemon skies of last summer are now streaked with gray clouds that threaten to wash rain and sleet over the granite curbs, across pavements and into the churning gray waters of the Amoskeag River. The trees that a few short weeks ago were afire with crimson and gold now stand naked and trembling in the cold November wind. Pastel blouses are packed away, replaced by wooly sweaters, and windows are latched to keep the frigid nights from creeping into my bedroom to steal the warm air from under my thick comforter. You might think that I would dread the eleventh month of the year, but I embrace November. I love the chilly breezes that promise to coat the wooded area behind my house in sparkling blankets of white snow. I love the scent of wood smoke that curls from rooftops and wafts across the crisp evening sky. I love the snaking lines of squirming children, who impatiently wait to sit on Santa’s knee, and the decorated wreathes and trees that overnight appear in store windows. November brings Thanksgiving- a time for all good families and friends to bond together over food and football. When I was growing up, Thanksgiving meant waking to the spicy aroma of turkey that was already roasting in the oven. We would drag out the cut glass and crystal dishes from the back of the china closet, and fill them with stuffed celery and black olives- delicacies that in our home were served only on holidays. The windows in my mother’s kitchen would cloud with steam as we brought bowl after plate of turkey, stuffing, and vegetables to our crowded table. And there would be pies- big sloppy pies, smelling of clove and cinnamon, overflowing with apple and pumpkin. Before dinner, we would crowd together around our mismatched tables and chairs, hold hands, and thank God for the bounty with which He had graced our family. After my children were born, we often joined my mother, my sister Martha-Jean and her husband Robert for Thanksgiving dinner. Their old farmhouse teemed with kids- cousins who banded together to play board games, trade baseball cards, and commiserate over teenage acne. Tables would groan from the weight of plates filled with homemade bread, cheese, vegetables and dip. The turkey sputtered from the bulging oven and pies lined the counter. Finally, at dinner time we would crowd together around mismatched tables and chairs, hold hands, and thank God for the bounty with which He had graced our family. 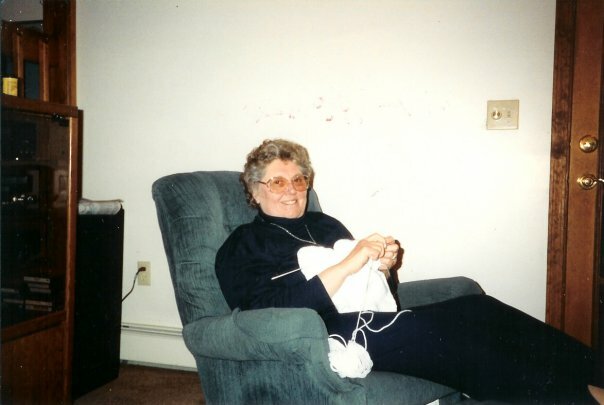 Last Thanksgiving, my mother had just received a diagnosis of leukemia. She was already weakened, preferring the comfort of her bedroom to joining the family for dinner. I ran back and forth from the kitchen to her room, bringing her snacks, filling her coffee cup, and sitting with her. Robert brought her a big box of chocolates and we indulged together, giggling like two naughty little girls who were sneaking treats. I treasure that last holiday with her. The memory is a gift I pull out of a soft velvet case every now and then. I close my eyes and the world stops. I hear my mother’s laughter, feel her soft cheek, smell her soft curls. But mostly I see her kind gray eyes. This year Thanksgiving is different. Gabriel will spend it with friends in Florida. Abby will split the holiday between our family and her future in-laws. Elizabeth will be preparing for Black Friday sales. And for the first time, my mother will not be here. The cold gray November skies will remind me of her warm gray eyes- eyes that lovingly watched her children and grandchildren and great-grandchildren gather around a Thanksgiving table. I will lift a toast to her and then we will once again gather around mismatched tables and chairs, hold hands, and thank God for the bounty with which He has graced our family.